In stock -This product will ship today if ordered within the next 4 hours and 20 minutes. Living Nature Mineral Eyeshadow - Glacier is gentle on the eyes and coloured by nature`s pure minerals. Enhance eyes softly with this natural light grey highlighter shade. Mica (CI 77019), Talc, Titanium dioxide (CI 77891), Squalane, Zinc stearate, Zea Mays (corn) starch, Silica, Iron oxides (CI 77492), Ultramarines (CI 77007), Iron oxides (CI 77491, CI 77499), Simmondsia chinensis (jojoba) seed oil**, Sorbic acid, Tocopherol acetate, Glycine soja (soybean) oil. **Certified organic. 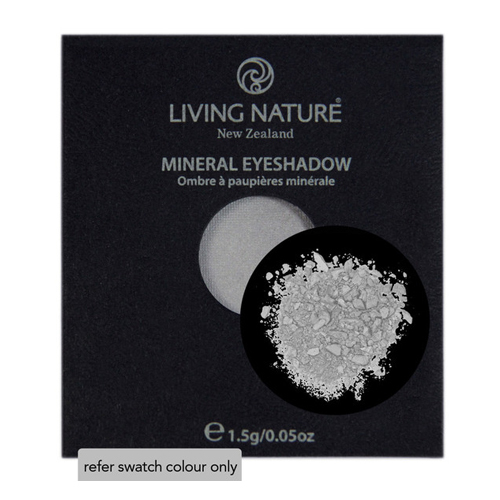 Below are reviews of Living Nature Mineral Eyeshadow - Glacier - 1.5g by bodykind customers. If you have tried this product we'd love to hear what you think so please leave a review.